Huebsch Command™ helps you run a smarter business by letting you easily accept mobile payments, control machines, and manage your laundry business from anywhere. At Huebsch®, we understand that when you have the facts—all the facts—there’s no limit to your business’s potential. With an intuitive interface and easy-to-use tools, Huebsch Command gives you the reporting, monitoring and configuration capabilities to do what you do best: make intelligent business decisions. Today’s consumers have more choices, more mobility and less time than ever before. By accepting mobile payment via smartphone, you can deliver a quick, convenient laundry experience that fits seamlessly into your customers’ lives. Cash and cashless options are available for online wallet reloading with the Huebsch app. Customers can take advantage of the Huebsch Value Center, where they can load value to their online wallets. Customers can view the status of their current cycle in the app and get notified when their laundry is done. The ability to manage all locations from one interface centralizes refunds and saves you time. Available via the Huebsch app, Huebsch Rewards helps you show appreciation for—and retain—your customers. Customers accumulate points and earn rewards for visiting your store. Huebsch Rewards lets you foster stronger connections with your customers, leading to increased loyalty—and the ability to positively influence buying behavior. You control how rewards are earned and redeemed. It’s fully integrated into Huebsch Command, so there are no third-party payment systems to install and maintain. The Huebsch app is available for smartphones running iOS or Android. 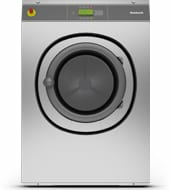 Huebsch Command™ is available on washer-extractors and tumble dryers ordered after January 1, 2017, and equipped with Galaxy™ 600 controls. All models are available in Slate, Stainless, Cityscape and Citron. In order to highlight key details, machine images do not adhere to a standard scale. Wireless, cloud-based and retaining all the Galaxy™ features you love, Huebsch Command lets you optimize your business from anywhere in the world with an internet connection. The initial setup takes minutes and the system is supported and upgraded by Huebsch, so you can breathe easier knowing we’ve got your back 24/7. Can be used on desktop, laptop or tablet. Receive service alerts via text or email and access your information at any time. Create automatically generated reports that can be texted or emailed to your phone daily, weekly or monthly. No need for dedicated IT resources. Backward compatible with existing Galaxy 600 installations—simply install networking board in each machine. Galaxy software needed only to set the network address for each machine. Peace of mind thanks to 24/7 support for store owners—the only offering of its kind in the industry. Interactive dashboards can be configured to show revenue, turns and a host of other values. Store owners can set Key Performance Indicator (KPI) goals for performance tracking. Show all locations or drill down to a single store. Location graphs for revenue and turns expand for individual-machine view. Single location or all locations. Exportable to PDF or Excel for further analysis. Customizable date range to allow view by day, week, month, etc. All existing Galaxy 600 audit reports are accessible within Huebsch Command. Any Huebsch Galaxy 600 report can be subscribed to via email or sent to a distribution list, employee, etc. Map view allows multiple locations to be grouped with a drag-and-drop boundary. Choosing a location will bring up specific information about that location—machine status, profitability reports, etc. All features of the Galaxy control are available. Configure machines with programs based on machine capacity and type. Programs can be sent to a single machine or to all machines of that type in all stores, and can be scheduled to allow time-of-day/day-of-week pricing, etc. Advanced tracking capabilities allow you to view account balances, transaction histories, payment methods and rewards points. And, you can issue refunds directly to your customers’ online wallets for improved customer service and efficiency. Because backing intelligent investors is our business. 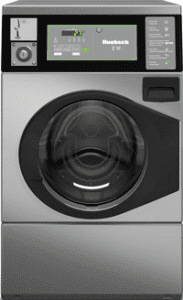 Your smart laundry partnership starts here. Sign up to receive email notifications about future Huebsch promotions. Huebsch by Alliance Laundry Systems | © 2018 All Right Reserved.